Proud, excited but also baffled and bewildered. Hibs boss Neil Lennon’s emotions have been pulled all over the place in recent weeks. Stunning Scottish Cup performances have propelled the holders into their fifth semi-final in the competition in the past six years, an impressive record but one which has been mirrored in recent weeks by decidedly below-par displays in the Championship. Three successive draws, including one with their quarter-final opponents Ayr United, culminated in a shock defeat by basement side St Mirren, a run which has put the Easter Road support, desperate to finally earn promotion at the third time of asking, somewhat on edge even if clear daylight remains between Lennon’s players and their nearest rivals, Falkirk and Dundee United. There have been reasons, of course, for a dip in form, Lennon’s central defenders succumbing to injury one by one, a crisis alleviated by the emergency loan signing of Celtic’s Nigerian internationalist Efe Ambrose until the end of the season. Lennon, however, believes the underlying explanation has more than likely been a subconscious concentration on the cup by his players, desperate not to let go of a trophy it took them 114 years to win, but to the detriment of their league results. “It drives me mental,” admitted Lennon. “Our last two cup games have been spectacular, our last four league matches below par. I’m very excited and proud of the players, in the semis again. That’s something to look forward to, but I would swap it all for promotion. Ayr had proved pesky opponents for Hibs this season, the only side to have inflicted a league defeat on them at Easter Road and, with the recent memory of that draw in Edinburgh, Ian McCall’s part-timers probably approached this match reasonably confident they could inflict another wound. However, they came up against the kind of whirlwind start which had blown Hearts away only a few weeks ago, John McGinn curling home a superb opener after only seven minutes, Jason Cummings then adding a second from the penalty spot five minutes later after Ayr’s Darryll Meggatt was adjudged to have brought down Martin Boyle. Referee Nick Walsh reckoned it was inches inside the box. Meggatt, not surprisingly, believed it was inches outside, revealing Boyle himself wasn’t sure if it was a penalty. Hibs appeared to be coasting with only 12 minutes played but a wonder strike from Craig McGuffie threw Ayr a lifeline and, claimed Meggatt, he and his team-mates felt they could get level only for on-loan Aberdeen defender Scott McKenna to be shown a straight red card a minute before the interval. 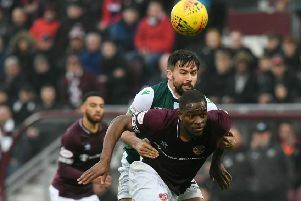 McKenna caught McGinn at waist-height as the ball was nicked past him, leaving Walsh with no choice but to send him off although the Hibs midfielder insisted there was no malice intended. He said: “It was just mis-timed, but it was a sore one. I got there before him. It was a high tackle but it wasn’t meant so no hard feelings. I got there ahead of him and I think I was clear through so the ref didn’t have a choice. Even so, insisted Meggat, until substitute James Keatings headed home Hibs’ third with only 11 minutes remaining, the tie remained in the balance. He said: “Even down to ten men I thought we did well. Lennon, though, begged to differ, saying: “No disrespect to Ayr, but it could have been five or six. We’d turned in a dreadful performance last Wednesday but we were emphatic, head and shoulders above Ayr who are a tough nut to crack. Lennon, however, insisted all focus is now on Friday night’s trip to Tannadice, the hope being his players can produce the sort of performance which swamped Dundee United at the turn of the year. Recent results have prompted a recall of last season when Hibs hit the buffers, at least in the league, when they endured a run which saw them pick up just five points from eight games but, argued McGinn, he and his team-mates are much better prepared given that experience. He said: “We know our mentality this year is to get up, to preferably be promoted as champions. Our form has been indifferent, I can’t put a finger on it. But, if we play like that, it will start to turn around. McGinn admitted he’d love to win the cup for a second year – and he believes Lennon’s players can beat anyone on their day – but insisted promotion would top such an achievement. He said: “You can’t say how important it is for us to be up there, the players know it, the fans know it, everyone at the club knows it. And if they do, insisted Lennon, his side would be more than capable of holding their own. He said: “We should be there, but we are not. We have to replicate what the likes of Ross County, Inverness, Hamilton and Partick have done. They have earned the right and are holding their own.